Former journalist, award winning news photographer,broadcaster, author and novelist, Robert Egby's autobiography stretches across almost eight decades and four continents. Entitled "Kings, Killers and Kinks in the Cosmos" it is subtitled: "Treading Softly With Angels Among Minefields." The author started his early life in England as an avowed atheist yet while suffering a disease which a doctor termed fatal, a spirit appeared and told him he would not die. He was only seven years old. His great-grandmother, a Seer, predicted his life, but he refused to believe her-until it started happening. Doors opened as if by magic. Work as a teenager in a unique film studio in England, living in a desert tent in Egypt, an act in a local variety show got him into professional broadcasting, journalism and news photography. He became an international correspondent meeting kings and killers. One gunman saved his life-twice. He was arrested in Baghdad for photographing kings eating and in Cyprus he scooped a major Press award for a newspicture. Strange Cosmic energies called kinks steered him away from being in a major British train crash and sailing on a troopship that sank. A spirit voice warned him of a vicious air attack and again saved him from walking through a Lebanese minefield. The voice warned him as bullets smashed through his hotel room. In all this, he suffered from a negative ego but this was about to change. The Seer had predicted he would go west though he vowed he never would, but it happened anyway. Arriving in western Canada, his work in broadcasting brought four awards for documentaries. Then he found himself living a double life, one professional in public relations the other a spiritual mystic. With the help of Spirit Guides and a Guardian Angel he embraced a life of metaphysics, healing, dowsing and higher learning, and in doing so dissolved the negative ego, the cause of all suffering. As predicted so many years before by the Seer, he set himself free and started to "work with the light" and help people understand Cosmic Forces. This book is the story of his personal quest. His life story is amply illustrated with over seventy photographs, most of which are his own. Today, in the United States he teaches a release from suffering and how to attain Cosmic consciousness. The author believes kinks in the Cosmos happen in everyone's life but many people fail to recognize these as opportunities and go with the flow. He became an international journalist and news photographer without any formal college or university training. He is the author of other books: Cracking the Glass Darkly; The Quest of the Radical Spiritualist and INSIGHTS: the Healing Paths of the Radical Spiritualist. The last two each scored Finalist citations in the USA Books News "Best Books" awards. His books are available through LSI/Ingram , Amazon, both in the U.S. and the U.K. and at bookshops around the world. Pages : 410 including 70+ photographs. Even ignoring faith, doesn't mean it won't come after you. "Kings, Killers, and Kinks in the Cosmos" tells the life story of Robert Egby and how he discovered his spiritual nature of his life and everything that went with it. Faced with certain death, a spiritual visit gave him the power to overcome the disease, and he shares his spiritual journey and how his once secular life turned his life around and changed it forever. 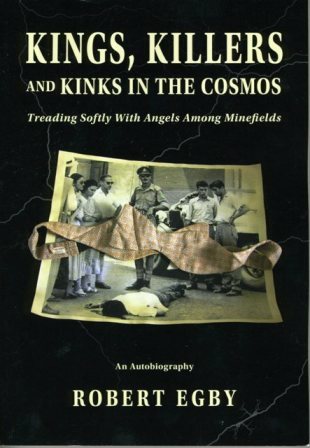 Very spiritual and very highly recommended reading for those looking for a book of discovery, "Kings, Killers, and Kinks in the Cosmos" is well worth considering.